More than 60 young Chinese students experienced an English writing camp in July, thanks to the Northwest Arkansas Writing Project based at the University of Arkansas. Vicki Collet, the writing project's associate director and an associate professor of curriculum and instruction at the U of A, directed the camps. Jennifer Wiggins, a fifth-grade teacher in Springdale Public Schools, and Amanda Coughlin, a first-grade teacher in Bentonville Public Schools, also led the camps. Jingshu Chen, a U of A doctoral student in curriculum and instruction who is from China, served as liaison for the project. Students ranged from eight to 15 years old and attended two-week camps in Nanjing and Shanghai, China. According to Collet, the interactive camp experiences were very different from traditional writing instruction in China, which is more lecture oriented. However, "the children were joyful and exuberant and quickly adjusted to this new way of learning," she said. "Our two goals were that students see writing as an enjoyable activity and that their writing improve," Collet said. "During Young Writers Camp, the Chinese students raced around a field on a scavenger hunt, looking for clues that would help them write a story." "We told students that they need to exercise their writing muscles every day," Collet explained. "Just like kids attending sports camps, writing takes practice and stamina. 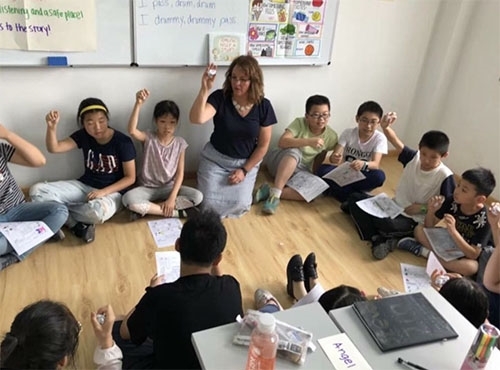 We gave the Chinese children lots of opportunities for both as they participated in individual, small-group, and whole-group writing experiences." Both students and teachers learned during this cultural exchange. "Working with English language learners while we assimilated to a brand new culture ourselves brought a new perspective for us," Wiggins said. Coughlin added, "The instructors and families welcomed us with open arms, and we couldn't be more thankful for that as we transitioned to their culture for 20 days." Wiggins and Coughlin both are designated teacher-consultants who completed the writing project's summer institute. Last year, Chen volunteered during a writing camp in Northwest Arkansas sponsored by the writing project. As she watched the children's writing improve, Chen knew the camps would also benefit Chinese children, who often learn to write in English at a young age. "I realized there was never any effective writing training in my 16 years of learning before graduate school," she said. "And, it is still the status quo for millions of kids in China, so I determined to bring (young writers camp) to China." Chen reached out to professors at universities in Nanjing and Shanghai, who sponsored the camps in their areas. Young Writers Camps are held every June at schools throughout Northwest Arkansas. For information about sponsoring a camp at your school, or to find out how to enroll your child in a camp, please contact Collet at collet@uark.edu. For more than 20 years, the Northwest Arkansas Writing Project has focused on improving writing in area schools. As one of 200 National Writing Project sites, it provides professional development for educators and directly reaches young writers through summer camps and other activities. For more information about Writing Project events, contact Collet or visit the Writing Project website.